We continue from where we left off at the end Part 1; exploring the Patch and Modulation capabilities of the Aspect semi-modular synth. This article will cover the last three components in the Patch section; the Lag Generator, the Adders, and the Sample and Hold unit. Download Aspect for Windows, Mac OS X, and Linux, in Audio Unit, VST, and RTAS Plugins formats. The Lag Generator slews the input Modulation Source, reducing the speed of changes. Similar to how Glissando causes note pitches to slide into one another, the Lag Generator can be used to make any Modulation Source slide. As the Lag Parameter increases, more time is taken for the Modulation Source to slide between changes. This example uses the Lag Generator to slew a Square waveform LFO which is modulating the Cutoff Frequency of a Lowpass Filter. Set LFO1 to Square shape, and Sync it to a rate of 1/2. 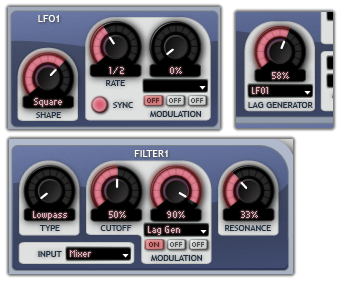 Connect LFO1 to the Lag Generator. Change Filter1's Cutoff to about 50% and Resonance to about 30%. Connect the Lag Generator Modulation Source to the Cutoff Modulation, with a Depth of about 90%. Hold down a note whilst slowly increasing the Lag Parameter. At low values of Lag, the Modulation Source still resembles a Square waveform. As Lag increases, the Square wave is softened and audible slides between the high and low values of the waveform can be heard. At higher values of Lag, the waveform starts to resemble a Sine, and eventually reaches a constant when the Lag is so much that any changes are too small to be heard. 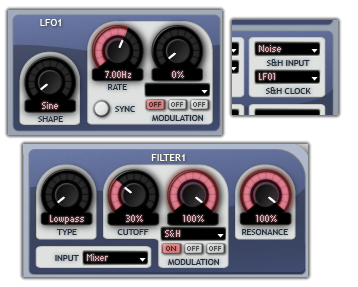 Download the Slewed Filter Cutoff Patch here. This example uses the Lag Generator to filter the White Noise Modulation Source. This creates a signal that slowly moves between random values (this type of movement is called Brownian Motion.) When used to modulate Pitch, this generates a meandering, detuned effect similar to the wow and flutter of an old tape recorder. Connect the Noise Modulation Source to the Lag Generator. Set the Lag to about 70%. Oscillator1 should be a Sine shape, with a Pitch of 1 Octave up. 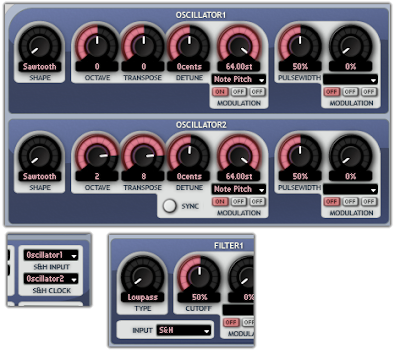 Connect the Lag Generator Modulation Source to Oscillator1's Second Pitch Modulation Source with a Depth of about 40 semitones. You may wish to connect several Modulation Sources to a component that only has one input connector (such as the Lag Generator, Sample & Hold, or Inverter components). Use an Adder to combine the Modulation Sources, and then connect this single Modulation Source to the chosen component. If all of a Parameter's Modulation Slots have been assigned, and you need to add another Modulation Source, you can combine multiple Modulation Sources into a single one with an Adder. This single Modulation Source will allow two Modulation Sources to use up only one Modulation Slot in a Parameter. Detune Oscillator2 by -1 cent. Link Oscillator1 and Inverter1 into Adder1's inputs. Choose Adder1 as the input to Filter1. Set LFO1 to Square, and Sync it to a rate of 1/4. The purpose of the Sample and Hold (S&H) component is to keep a Modulation Source's value steady for a short time. The component takes two inputs, a Source and Clock; whenever the S&H Clock input source changes from a negative to a positive value (known as a zero-crossing), the current value of the S&H Input source will be taken and held steady until the next zero-crossing. Connect the Noise Modulation Source to S&H Input. Connect LFO1 to S&H Clock. Set LFO1 to a rate of about 7Hz. Connect S&H to Filter1's first Modulation Slot with a Depth to 100%. Set Filter1's Cutoff to about 30% and Resonance to 100%. Download the S&H Filter Patch here. With Aspect, because there is no difference between Audio and Modulation signals the Sample and Hold component could also be used to sample an audio source at a specified clock rate. This distortion is known as Sample Rate Reduction, and produces a lo-fi, crunchy timbre. Connect Oscillator1 to the S&H Input, and Oscillator2 to the S&H Clock. Select S&H as the Input for Filter1. Tune Oscillator2 up by 2 Octaves, and Tranpose is to 8. Reduce the digital harshness slightly by setting Filter1 Cutoff to 50% and add a little bite by turning the Resonance to 50%. Download the Low Sample Rate Distortion patch here. Our Featured Artists page is now up, together with praise for the Aspect semi-modular synth courtesy of our first featured artist, Piet Kaempfer from acclaimed Progressive Trance duo Protonica. Piet says, "Aspect got my attention with its stylish, clear design. It's a genuine synth with its own character." Read what else Piet had to say about Aspect here. Aspect's flexible patching and modulation system can be a source of confusion to users more used to synthesizers with a fixed architecture. In synthesis, to modulate a parameter means to change the parameter's value whilst the sound is playing. This adds interest to what would otherwise be dull, static sounds. Most synth users are familiar with the basic modulation sources - envelopes and LFOs (low frequency oscillators). One common arrangement is the modulation of an oscillator's pitch by an LFO, producing vibrato. Another is the modulation of a filter's cutoff frequency by an envelope, resulting in a sound that has varying degrees of brightness as the higher frequencies are dynamically removed. Aspect is a synthesizer in the tradition of semi-modular synthesizers like the Korg MS-10 and Korg MS-20. The appeal of these instruments is not only in their fantastic analogue sound, but in their versatility. Re-routing means that any nearly any component can be used as a modulation source. The Patch panel expands this concept by allowing modulation sources to be combined and transformed in various ways. 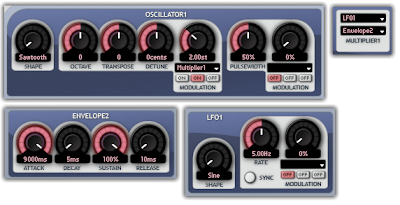 Download Aspect for Windows, Mac OS X, and Linux, in Audio Unit, VST, and RTAS Plugin formats. Left-click the Parameter's Modulation combo box. Select the required Modulation Source from the drop-down list. Left-click on the Parameter's Modulation combo box. Select 'Off' from the drop-down list. Left-click and drag the Parameter's Modulation Depth rotary control upwards to increase the Modulation Depth, or downwards to decrease it. Holding Shift whilst dragging allows fine resolution changes to be made. One typical use of an inverted Envelope shape is in the creation of pad sounds. Here we have a pad sound through a Lowpass Filter, with the Filter's Cutoff modulated by an inverted Envelope shape. This creates a sound with an unconventional flourish at the end: where a pad normally grows duller during the Release stage as the Filter is closed, here it gets brighter during Release as the Filter opens. Download the Inverter Filter Pad Sound patch here. Here is another example of an inverted Modulation Source. This tutorial on sequencing with a modular synthesizer uses an inverted Sawtooth LFO routed to the Output Amplifier to produce a quick Attack and slow Decay repeating envelope shape. Start with an empty Program by clicking File / New Program. Assign Note Pitch to Inverter1. 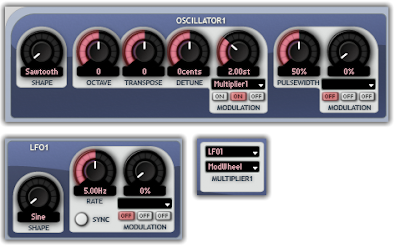 Replace Oscillator1's Note Pitch Modulation Source with Inverter1. The Oscillator is now controlled by the inverted Note Pitch. As you move up the keyboard, the pitch of the oscillator decreases! Download the Inverter Keyboard patch here. Set LFO1 to a rate of 5Hz. Set the first input of Multiplier1 to LFO1, and set the second to Mod Wheel. Part 2 of this tutorial will cover the remaining Patch Components, which are the Lag Generator, the Sample & Hold unit, and the Adders. Boards of Canada's Music Has the Right to Children is an album full of intriguing synthesizer lines and processed sampled sounds. Perhaps the most recognizable is from Roygbiv; a phat, laid-back slice of analogue nostalgia. Roygbiv, the name taken from a mnemonic for remembering the orders of colours in the visible spectrum, opens with a deceptively simple bass sound. It is this bass that we will recreate. Whilst the Scottish two-piece are notoriously cagey about techniques and equipment, they are known to make good use of analogue synths. The bass in question is likely a Roland SH-101. Aspect excels at recreating these analogue style sounds. The Aspect evaluation can be downloaded here in VST Plugin, Audio Unit, RTAS, and Standalone formats for Mac OS X, Windows, and Linux. Start, as all good sound designers generally do, with the initial patch by choosing New Program under the File menu. The bass is obviously monophonic, so leave the Polyphony set to 1. The general rule for subtractive synth sound creation is, start with the oscillators. Oscillator1, set to 100% in the Mixer, should be dialed to Sawtooth. Oscillator2, also 100% in the Mixer, should be set to the Pulse shape with a Pulsewidth of about 75%, and detuned down an octave (turn Oscillator2's Octave rotary to -1). Finally, a little noise helps add some grit to the sound: set the Noise level in the Mixer to about 21%. The bass sound has a fairly simple amplitude envelope shape. Set Envelope1's Attack and Decay to their lowest setting (1ms and 5ms, respectively). Set Sustain to 100%, and Release to about 4000ms. This gives a punchy bass sound with a fairly long tail. Even small changes to the filter produce huge changes in this sound. As is normally the case with bass sounds, we'll use a Lowpass filter. Set the Filter1's Cutoff to 33%, and set the keyboard tracking modulation (called Note Pitch in the modulation menu) to about 75%. Sounds nice, but lacks Roygbiv's growl. We can fix that. Assign Envelope2 to Filter1's modulation with a depth of 61%. The appropriate envelope shape should have a quick Attack and a slow Decay/Release. Let's use Attack 25ms, Decay 2500ms, Sustain of 45%, and Release of 3000ms. A filter Resonance of about 2% adds the necessary bite to the sound. A few last tweaks introduce some analogue authenticity. A slow wavering of the pitch adds some subtle warmth to the sound. Set LFO1 to a rate of about .30Hz, and route it into Oscillator1's second Pitch Modulation Slot with a depth of a few cents (0.02 semitones sounds good). Likewise, set LFO2 to a rate of about .10Hz, and route it into Oscillator2's second Pitch Modulation Slot, this time with a depth of about 0.09st. Aspect's second filter can be used to grunge up the sound a tad. Route Filter1 into the Input of Filter2, and set Filter2 to Highpass with a Cutoff of 0%. The Output Filter Mix should be about 15% to add a small amount of the high-passed signal into the chain. Finally, turn on Always Glide in the Global section, and set Glissando to 12%. This provides the sliding movement between two consecutive notes played at different pitches. So here is the Roygbiv subtractive synth patch for Aspect, and this is what the recreation sounds like. The fairly heavy reverb present in the original song is here provided by Apple Logic's AVerb plug-in. Adding a warm tape-style compression and some subtle eq would likely produce a more authentic sound. This is left as an exercise for the reader.